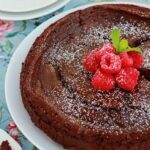 This rich and decadent Flourless Chocolate Cake Recipe is easy to make and the perfect dessert for any occasion! Made with bittersweet chocolate, sugar, butter, and eggs. This cake has it all. It is rich, decadent, and the perfect way to indulge. Truth be told, I had never had a flourless cake before this one. It was nothing like I had expected. Instead of a light and airy cake I am used to, this is dense and very very rich in flavor. We call it our special occasion cake. I make this for family birthdays and holidays. It tastes amazing, and looks stunning, served with fresh fruit and a dust of powdered sugar. An easy show stopper that will have everyone in awe of your baking talents. Should flourless chocolate cake be refrigerated? This cake recipe does not need to be refrigerated. However, we like ours chilled. The flavor betters with time, so make it a day early and pull it out of the refrigerator 2 hours before you are ready to serve. Flourless chocolate cake is not necessarily gluten free. However, most of the ingredients used should make this a gluten free recipe. Be sure to check all of your ingredients before serving to your gluten free friends. Preheat your oven to 300 degrees. Line the inside of a 10 inch spring form pan with parchment. Lightly mist with non-stick spray and set aside. Combine the water, salt, and sugar in a small sauce pan. Heat to a simmer and stir until all of the sugar has dissolved. Remove from the heat and stir in the vanilla extract. Combine the butter and chocolate in a glass or heat proof bowl. Melt in the microwave or over a double boiler. Place your melted chocolate into the bowl of an electric mixer and whip until cool. Add the dissolved sugar mixture followed by the eggs and egg whites. Stir until fully incorporated and pour into your prepared pan. Bake 45 minutes. The middle will look wet, but don’t worry it is finished. Allow to cool 20 minutes then transfer to your refrigerator for at least 4 hours. Serve with ice cream or your favorite fruit! Hi Jessica – This cake looks amazing and is a perfect addition to dinner for two! Thanks so much for sharing and pinned – have a happy Monday and a wonderful Valentine’s Day! What a beautiful cake. 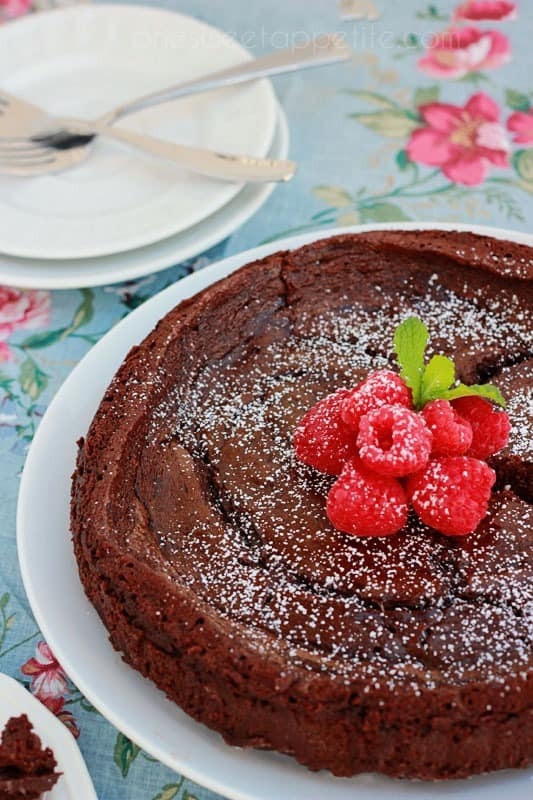 I love the richness of flourless cakes and this one is perfect for Valentine’s Day. This looks great! I do enjoy a flourless cake when its in front of me. What a great cake idea! Having celiac disease, i’m always looking for a flourless option! This cake looks so rich and delicious! I have been wanting to try and make a flourless cake for some time now. I think I will try this recipe. Thank you for sharing! what a beautiful cake! I’ve been wanting to try a flourless chocolate cake too, but haven’t gotten around to it yet. Yours looks absolutely perfect for Valentine’s day! This sounds amazing. I can’t believe that it’s flourless! Jessica, this cake looks absolutely dreamy! It’s the perfect Valentine’s (or any day 🙂 treat! This looks seriously incredible. I love that it’s dense and chocolately. I can’t wait to try it. Looks so delicious. 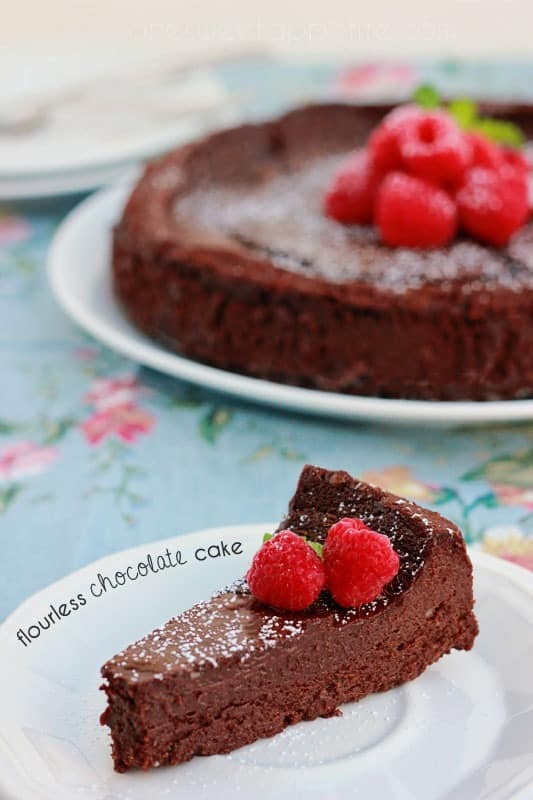 I can imagine flourless cake being very fudgy which just sounds amazing right now. Ha! 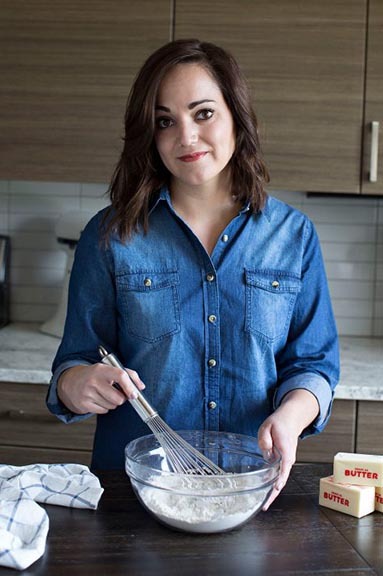 Do the egg whites have to be whipped to stiff peaks before adding? Other recipes call for this but your recipe just says add egg whites. Nope. Just add them straight in. Also, this has to stay refrigerated or can it be stored at room temperature? Mine is not really staying together when I cut it…it falls apart, any remedy to that? I use cocoa powder instead of chocolate chips, same amount as the recipe. And I put extra 2 cups of sugar ( yes, lots of sugar , I know) and extra butter (half cup). The cake come out so beautiful, and no need to refrigerate. Just cool it down an hour before serve. 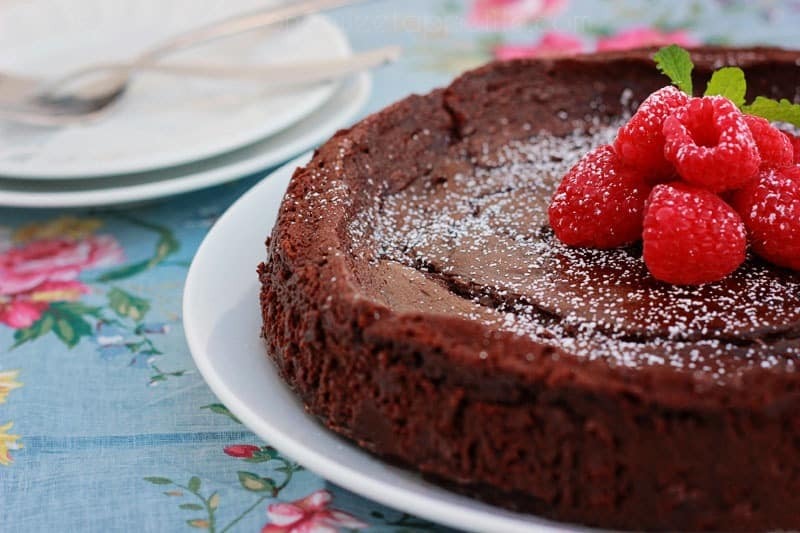 Thanks for sharing this wonderful recipe, I have been looking for a good flour less chocolate cake recipe for long time, this one is my favour.